Every one is to hear the last call to the marriage supper of the lamb. 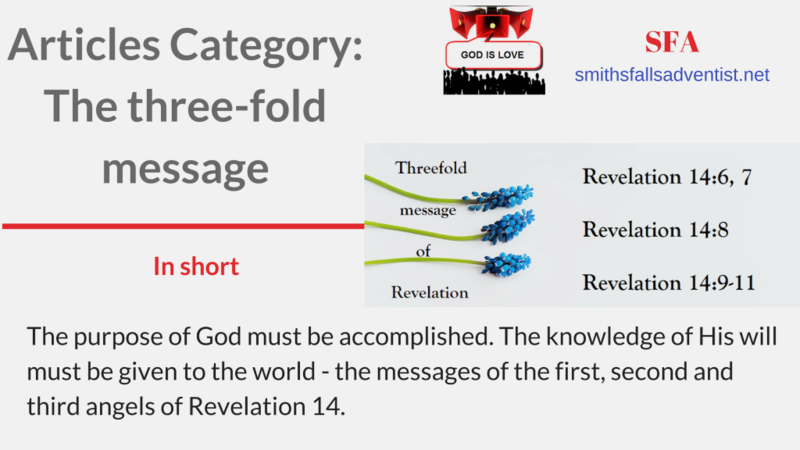 All articles here are intended to proclaim the present truth – the light of the great threefold gospel message of Revelation 14. The result of the threefold message will be announced: Here are they that keep the commandments of God, and the faith of Jesus. And this message is the last to be given before the coming of the Lord. Immediately following its proclamation the Son of man is seen by the prophet, coming in glory to reap the harvest of the earth. The knowledge of His will must be given to the world. In this day, God has called His church, as He called ancient Israel, to stand as a light in the earth. Moreover, to communicate to the world the messages of the first, second, and third angels of Revelation 14. Christ came to our world to represent the character of God as it is represented in His holy law. For His law is a transcript of His character. Christ was both the law and the gospel. The angel that proclaims the everlasting gospel proclaims the law of God. For the gospel of salvation brings men to obedience of the law, whereby their characters are formed after the divine similitude. The Sabbath memorial, declaring who the living God is, the Creator of the heavens and the earth, has been torn down. A spurious sabbath has been given to the world in its place. Thus a breach has been made in the law of God. The second angel, who, flying through the midst of heaven, cried – Babylon is fallen, is fallen, that great city. Revelation 14:8. That message was first proclaimed by the servants of God in the summer of 1844. As a result, many left the fallen churches. In connection with this message the “midnight cry” (See Matthew 25:1-13) was given: Behold, the Bridegroom cometh; go ye out to meet Him. It had a more direct application to the churches of the United States, where the warning of the judgment had been most widely proclaimed and most generally rejected, and where the declension in the churches had been most rapid. But the message of the second angel did not reach its complete fulfillment in 1844. The churches then experienced a moral fall, in consequence of their refusal of the light of the Advent message, but that fall was not complete. As they have continued to reject the special truths for this time, they have fallen lower and lower. Not yet, however, can it be said that Babylon is fallen, . . . because she made all nations drink of the wine of the wrath of her fornication. She has not yet made all nations do this. The work of apostasy has not yet reached its culmination. The perfect fulfillment of Revelation 14:8 is yet future. Though we are now under the proclamation of the third, all three of the messages are still to be proclaimed. The warning of the third angel, which forms a part of the same threefold message will be no less widespread. The banner on which is inscribed – “The commandments of God and the faith of Jesus,” is to be raised on high. The power of the first and second messages will be intensified in the third. It is represented in the prophecy as being proclaimed with a loud voice by an angel flying in the midst of heaven, and it will command the attention of the world. yet the people of God will not receive it. The prophet beholds them that had gotten the victory over the beast, and over his image, and over his mark, and over the number of his name, stand on the sea of glass, having the harps of God, and singing the song of Moses and the Lamb. Revelation 15:2, 3. We pray that all this will be your experience in the power of the Spirit.